I love the one in my tub so I thought this would be good for my sink. Works great. Does a great job and easy to clean. Now I only use the mold growing trap that comes with the sink when I need to fill the basin. This is my second SinkShroom and I also have a TubShroom. They work great! The TubShroom drain hair catcher works great! It's eye-opening to see how much hair would be going down the drain without it. Only drawback is you can no longer hold water in the sink without removing it and replacing the original stopper. I bought the one for the tub first and loved it. My sink was clogging too, so now I have one for it. Love these! We were always having to put Drano down the sink and tub or use the plunger and I bought the mushroom for the tub first and saw how amazing it was and just had to buy one for the bathroom sink. It's just as wonderful! It's a perfect fit, easy to clean, and has lasted such a long time already. I've had no issues with mold or anything. I tell everybody about them! I will certainly order these for all of our sinks and drains & give them as gifts as well!! Love these! I have for both my bathtub and bathroom sink. They do a Great job of keeping unwanted hair out of the drain but still allow water to flow like normal. You don't realize how much hair is going down your drain until the first time you clean this off. Worth every penny. I love this thing! So easy to clean and really catches all the hair that used to create such a nuisance in the shower. 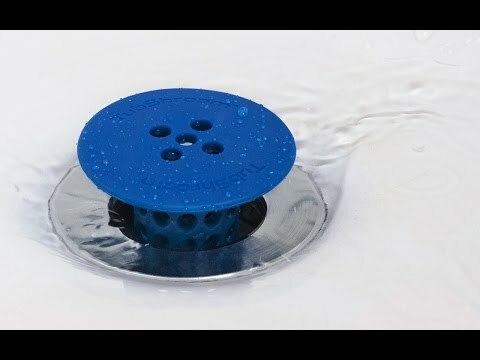 The best drain filter ever! Easy to clean, maintains bright white color, no more drain problems!